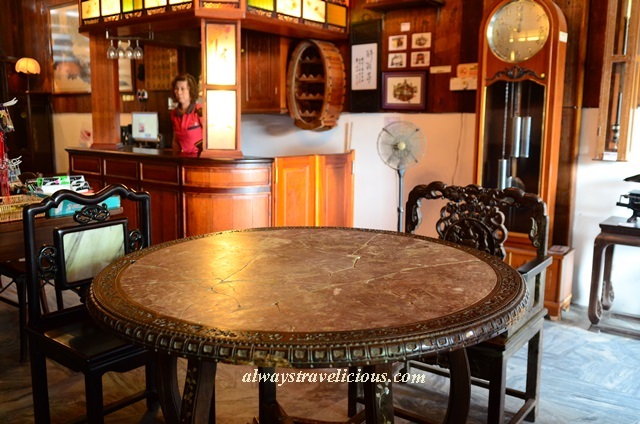 Gopeng Museum - Heritage House, Malaysia - Always Travelicious ! The Heritage House in Gopeng is part of the Gopeng Museum, displaying a way of life from the last century. The Heritage House is made possible by one of the caretakers, Mr Wong Kun Cheong who is an avid antique collector as many of the items showcased are his own collections. I love exploring old houses because they are usually deceiving and awaiting for you with the unknown. The Heritage House too may seem small and narrow from the outside, but like all the old houses, it is long and ignites the curiosity to check out what is on the other end of the house. There is no boring corners in the house; even the space underneath the stairs is transformed into a barber shop! The kitchen area back in the days when fire came from burning wood or charcoal. The attention to details is incredible from cassette radio, old make up box, to bamboo sieves and rusty woks! At the back of the house, there is a kopitiam where you can leisurely enjoy a cup of tea of coffee. Don’t worry about your drink coming out from the rusty facilities because this part is only the display section. Aerial view of the kopitiam. Do check out the living room that’s just above the kopitiam, which is a stand-alone area not connected with the rest of first floor. The upstairs area is the living quarters with the bedrooms and living rooms. The second living room / games room that’s set up on the balcony, catching a bit of breeze and sunlight. and things from the colonial era like the British style sofas. As I wandered around the house, there were some interesting items that have intriguing functions. This machine here obviously looks like a weighing scale, but specifically, it is a weighing machine for babies. This is another weighing scale from 1870’s which arrived with the British as they came to Gopeng for tin mining. I would have thought it was a lamp if I didn’t read the description tag on the wall! The floor on the second floor has an opening to allow the transferring of items up and down with ease. Address: 6 Jalan Sg Itek, 31600 Gopeng, Perak. Nostalgic! Very well photographed! And thanks to the caretakers for opening the Heritage House to the public.